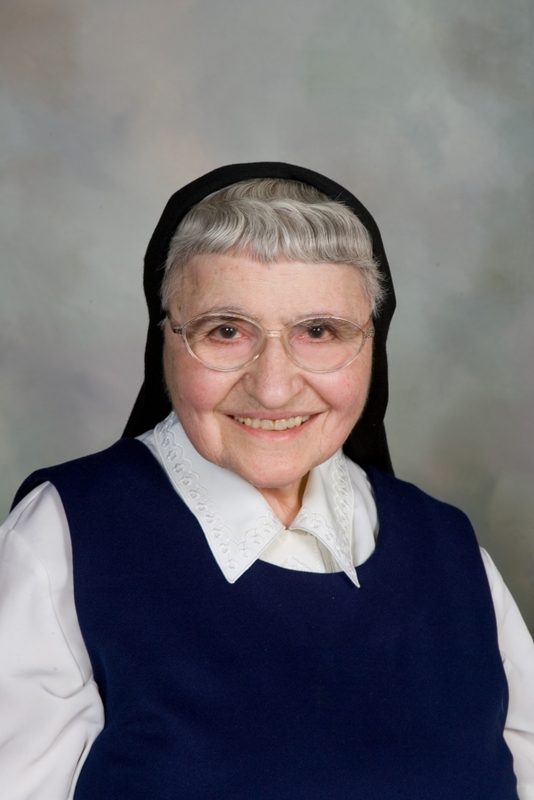 The Eucharist of Christian Burial will be celebrated at 10:30 a.m. on Thursday, February 14, 2019, at Sacred Heart Chapel, Saint Benedict’s Monastery, St. Joseph, Minn., for Sister Clare (Clarion) Shadeg, who died, age 95, on February 11, 2019, at Saint Scholastica Convent, St. Cloud, Minn. Burial will be in the monastery cemetery. Friends may call at Saint Scholastica Convent on Wednesday, February 13, from 1–4:30 p.m., or for a Vigil Prayer Service at 7 p.m. at Saint Benedict’s Monastery. Visitation continues at 9 a.m. until the time of the funeral on Thursday, February 14. Clare Shadeg was born March 3, 1923, to Henry and Rose (Hackenmueller) Shadeg in Farming, Minn. She was the 11th of 14 children, six brothers and seven sisters. She attended the district school in Farming and Saint Benedict’s High School in St. Joseph. She entered Saint Benedict’s Monastery on August 28, 1939, was received into the novitiate June 22, 1943, made first monastic profession on July 11, 1944, and perpetual monastic profession on July 11, 1947. Clare earned a B.A. degree in elementary education with a minor in philosophy from the College of Saint Benedict, St. Joseph. She also attended the Diocesan Teachers’ College in St. Paul, Minn., St. Cloud State University in St. Cloud and St. Norbert’s College in DePere, Wis.
She served as an educator, teaching in primary grades at Holy Angels, St. Paul’s, St. John Cantius and St. Anthony’s Schools in St. Cloud. She also taught in Tacoma, Wash., and Luxemburg, Hutchinson, Millerville, Urbank, St. Joseph Lab School in St. Joseph, Eden Valley and Melrose, all in Minnesota. At Saint Benedict’s Monastery, S. Clare worked in development and in the monastic archives. She was also involved in teaching religious education on Wednesdays at Upsula, Minn., and Elmdale, Minn., from 1994–1998. Clare is survived by her sisters, Mildred, Sister Ann Marie, OCD (Rose), and Esther Turbak. She was preceded in death by six brothers, Oscar, Henry, Alfred, Father Thomas, Father Werner, SVD, and Father Norbert, SVD, and four sisters, Dorothy Stommes, Sister Debritto, OSB (Eleanor), Sister Mary Carmel, OCD, and Sister Mary Rose, OSC (Agnes).